Put oven rack in middle position and preheat oven to 350°F. Line 2 mini-muffin tins with mini-muffin cups. Whisk together flour, baking powder, and salt in a bowl. Stir together milk and vanilla in a small bowl. Beat together butter and sugar in a large bowl with an electric mixer at medium-high speed until pale and fluffy, about 4 minutes. Add egg and beat until just combined. Reduce speed to low, then add flour and milk mixtures alternately in batches, beginning and ending with flour and mixing until just combined. Divide batter among muffin cups, filling them two-thirds full, and bake until tops are pale golden, about 12-13 minutes. 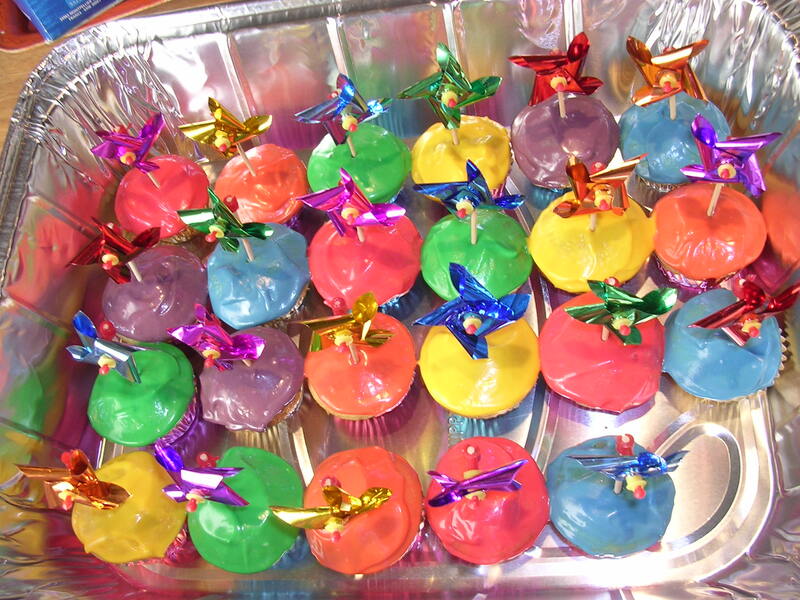 Transfer cupcakes to a rack and cool completely. Using electric mixer, beat cream cheese, butter and vanilla in large bowl until smooth. Add powdered sugar 1 cup at a time, beating until smooth after each addition. Transfer to bowls and stir in food coloring of your choice. Spread 1 tsp frosting onto each cooled cupcake. Note: I made these for an (adult) birthday party and were a hit. Their size made them very easy to eat (in one bite!). I created a bunch of festive frosting colors and put a mini-pin wheel on each one. Very fun! They would be great for a childs birthday party. They were also quite easy to transport in a aluminum tray.